In Tapestry of Healing Jeri Mills blends her unique background as a girl who grew up in the circus and later became a veterinarian, physician, healer, storyteller, and poet into a fascinating and informative book. The book draws the reader into Mills’ world with all the warmth she would extend to a friend coming into her home. Tapestry of Healing, the story of Dr. Mills’ personal journey into the frontiers of energy medicine, expertly weaves together the scientific and the mystical. As this intuitive medical doctor shares her experience of integrating energy healing into every aspect of her Obstetrics and Gynecology practice, she takes you with her every step of the way. 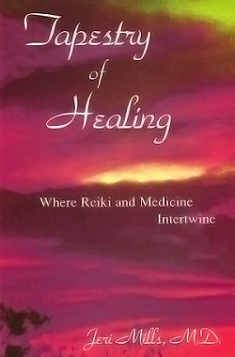 When Mills weaves inspirational stories into an introduction to energy medicine, even those with no previous knowledge of Eastern systems can easily understand her contemporary explanation of ancient healing arts. And as you close this book, you will want to meet Jeri Mills, to learn more.